Perhaps Sylvie Horvath’s dark eyes glisten the way they do because she has surrounded herself with beauty. 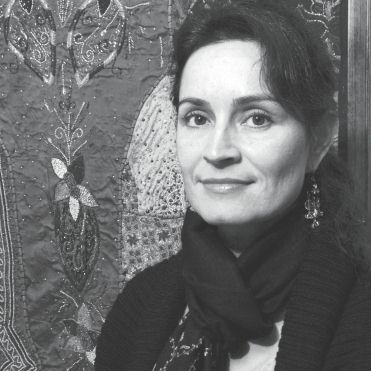 Horvath is a collector of contemporary art by local Milwaukee artists, as well as an importer of Kashmiri and Indian rugs, pashmina shawls, brass sculpture, papier maché decorative objects, jewelry and wall hangings. Or perhaps the reason her eyes shine so brightly is because she has been studying, practicing and teaching yoga for over 20 years, and is a student of ayurvedic medicine, an ancient Indian system of health care. Hard to say. Horvath began her business, Jewel of India Imports, in 1998, after a trip to Kashmir and India where she fell in love with the indigenous arts and crafts. She returned with a few items that artisans in Kashmir had entrusted her to sell. Today she offers a wide variety of items at craft fairs and her newly-developed web site, pashmina-india.com. Horvath said that she is encouraged by the growing number of sales she has made to local and out-of-state customers on her web site and is hopeful that it will reach a larger customer base in the future. Jewel of India Imports offers an extensive selection of merchandise. Pashmina shawls are a specialty item. They are hand-loomed and handembroidered shawls made of fine wool. Sometimes they are blended with silk. Other specialties include silk and wool rugs, jewelry and naqash (papier maché) knickknacks and ornaments painted with intricate designs, colorful Thangkas (spiritual Tibetan paintings), and healing sticks by master sculptor Ume. There will be a Jewel of India Imports booth at the Quaker International Holiday Fair on December 1 at the Quaker Meeting House, 3224 Gordon Place. Horvath will be displaying and selling traditional Indian jewelry and contemporary pieces, as well as Kashmiri silk rugs and wool chainstitched rugs. “I enjoy the art I sell, and I like to find things that I think are beautiful. I like to share them with people. I wouldn’t be interested in being involved in the business otherwise. I know 90 percent of the people who make the things I buy. That’s really important to me to have a relationship with the people,” Horvath said. Horvath makes jewelry out of the semiprecious stones she buys in Asia. She works with rubies, peridot, citrine, amethyst, quartz crystal, green garnet, iolyte and tourmaline. She does original design and also takes custom orders. She has built her business piece by piece over nearly a ten-year time span. “It’s like any business. It takes effort and time. It takes hard work. I keep doing it because I love the pashminas and rugs. I make it fit into my life,” Horvath said. Horvath enjoys travel and the internet business suits her lifestyle. “If I had a store, I feel like I would be more tied down and have to be there all the time. I like the freedom so that I can travel and not have to rely on somebody else to run the store,” she said. Horvath said that her ayurvedic and yoga practices help her to focus on the original intention of yoga as a spiritual practice. “You are working with consciousness with the body and through the mind, with an awareness of the original intention of yoga, which is integration, wholeness, completeness, and returning to the source – the source of your being. It’s a journey. It’s becoming aware. It’s like you are gradually waking up more and more,” she said. “You get more connected with your inner being and you can get in alignment with that.” Each week she teaches two yoga classes at the Mindfulness Practice Center, 2126 E. Locust Street, and privately teaches meditation classes and more yoga classes. Horvath has a deep love for the people of Kashmir, who are mostly Sufis. Sufism is a mystical branch of Islam. She said the Sufis are very tolerant of differences. “Sufis really focus on love. For Kashmiris, their root is love. The Kashmiri people are really wonderful and hospitable,” she said. “That’s one reason my business got started out so well, because they trusted me, and they let me just take things without paying. Of course, I did pay them eventually. And they still trust me. We have a great relationship,” Horvath said. Because the Kashmiris extend trust to her, Horvath is able to test-market new and different merchandise without assuming too much risk. She said that craftspeople and business people in Kashmir are anxious to find channels for their exports and appreciate the opportunity to do business with her. Horvath, who majored in psychology at UWM, grew up in Reno, Nevada. She lives in one of the oldest houses in Riverwest, which she said was built in 1884. When she first moved to Milwaukee she lived on the East Side but then migrated to Riverwest, where she has lived for the past eight years. She likes living in Riverwest because it brings her close to a very diverse population and an interesting crosssection of society. “I’m not planning to move any time soon,” she said. For further information call Jewel of India Imports at 414-372-4356, or visit pashmina-india.com.